Gambia has a unique way of voting for their president - instead of ballot papers, voters use marbles. In the 2012 election there were only two invalid votes when people placed their marbles on the top of the voting drums. Umaru Fofana demonstrates how it is done ahead of the election on 1 December. 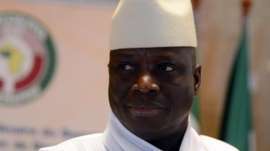 Who is The Gambia's Yahya Jammeh?